An amazingly charming and very tiny travelling alarm clock came to light recently, which is pictured here. It is so exquisitely made that I was tempted to try to research something about the little-known maker. It is signed 'Thomas Pott. St. James's Street'. Pott is an unusual name, as we expect to see the more common form of Potts. In fact when I first saw this clock I noted it in error as Potts, with an s. Thomas met with this trouble throughout his life, as people often recorded him by the name they expected to see or hear, namely Potts, with the s. He must have fought against this, but official records seem to specify him randomly as Pott or Potts. This made it difficult to distinguish him as a clockmaker from the numerous other people called Thomas Potts, quite a few of whom cropped up in the records in the same period and district - and even one or two others called Thomas Pott! I can sympathise with poor Thomas. For many years I have received letters from careless typists which corrupted my surname as Toomes, Zoomes, Goomes, Soomes, Loomis, Lumis, Lomas, Bloomes, Bloomer, and Bloomers! Amazingly these were delivered faithfully through thigh-deep snow and sheep-dip muddied waters by our dogged rural posties, who sometimes even arrive with letters addressed to 'the clock man, Yorkshire'. Of course, I will never know how many Zoomers, Goomers and Doomers received letters intended for me that left them bewildered! Thomas Pott was the son of Mark Pott, late of Newcastle on Tyne, who was 'deceased' at the time Thomas was apprenticed through the Clockmakers' Company on 6th January 1713/14 to John Bayley for six years at a premium of £16.00. Infuriatingly they wrote him down as Potts. Armed with this knowledge I found that he was baptised on the 7th December 1697 at All Saints Newcastle son of Mark Pott and that Mark Pott was married there 30th August 1696 to Mercy Blunt. There seem to have been no other children of that marriage. I could find no death for Mark Pott, nor Mercy Pott, nor any subsequent marriage of Mercy as a widow. Mark may have been born at Gateshead in 1663, the son of another Thomas, but that is no more than a guess, though its relevance will appear later. This means that Thomas was just over sixteen at the time of apprenticeship, whereas the usual age was fourteen, and the usual term was seven years. The shorter period was perhaps because he was a year older than usual. It may be that he was shipped off to London as an orphaned apprentice because his mother could not afford to keep him at home, his apprenticeship 'premium' as the fee was called, being paid by relatives or even a local parish charity. It may not be insignificant that the first apprentice he took on himself was partly paid for by a charity. His apprenticeship would have ended in January 1719/20. His next step would normally have been to take up freedom in the Clockmakers' Company, but he did not. Strictly speaking he was not allowed to trade in his own name without that freedom, though that rule was not always enforced. But if he worked as a journeyman for another master clockmaker, he did not need the freedom to trade on his own. So this may explain it. 1. The dial of this tiny travelling alarm clock by 'Thomas Pott. St. James's Street' measures only three and a half inches wide by five inches high. Date very hard to define but perhaps 1740. Thomas Pott was buried on the 25th January 1766 at St. James's, Westminster. I was delighted to find that he left a will, which is dated the 8th September 1753, a good thirteen years before his death, and it was proved on the 31st January 1766. But my pleasure was short-lived as it is one of the least informative and most boring wills I have ever come across. Apart from confirming that he was Thomas Pott (with no s) 'of St. James's Westminster, watchmaker, being in perfect health ...', he simply left everything to his wife, Elizabeth. I tried to trace his marriage to Elizabeth X and found only one that would fit : on the 13th June 1743 at St. Mary Marylebone Thomas Pott married Elizabeth Trott. I could find no evidence that they had any children but if they did, then Thomas made no mention of them in his will. His widow, Elizabeth Pott, survived him by ten years and was herself buried at St. James's Westminster on the 27th August 1776. I could trace no will for Elizabeth. If they left any wealth of any kind, and it seems reasonably to suppose they did, I have no idea what happened to it. 5th July 1737 Thomas Potts, Citizen and Clockmaker, took Edward Arnold, son of Edward Arnold of West Ham, for 7years for a premium of £5 plus £5 charity. 3rd September 1745 Thomas Pott, watchmaker of St. James's Westminster, took Joseph Campbell, son of William Campbell, for 7 years at £21. 14th January 1745/46 Thomas Potts, Citizen and Clockmaker, took John Bowtell, son of Benjamin Bowtell, deceased, for 7 years at £10. 15th March 1749 Thomas Pott, watchmaker of St. James Westminster, took Thomas Darlington son of Edward Darlington for 7 years at £20. 8th August 1754 Thomas Pott, watchmaker of St. James, Westminster, took Samuel Barkis for 7 years for £22. The term Citizen and Clockmaker could be used only by someone who was a freeman of a City Company - which we know he was not, at least not of the Clockmakers' Company, through which he was apprenticed. Yet these two apprenticeships were signed through that Company. How could that be? Well, strictly he should not have been allowed to do this, but control was sometimes lax, and a man who was a former Company apprentice and had long been working in the trade (over 17 years when his first apprentice was bound), might have been assumed to be a freeman, and perhaps nobody checked. But oddly in three apprenticeships he is simply described as a watchmaker. What other information I could find about him was limited, again sometimes as Pott, sometimes Potts. On the 15th March 1735/36 Thomas Potts of the parish of St. James's Westminster was in Middlesex Sessions in a court in a case involving Thomas Wackett. "Middlesex Session February 1736The King against: Thos: Potts. Thomas Potts of the Parish of St: James's Westminster. Defendant maketh Oath that he hath made a Due and Dilligent Enquirey after Thomas Wackett Plantief in this Cause late of the Parish of St. Gileses in the fields and Cannot here or get any Intelligence where he is nor any Directions from any Person or Persons where to make a further Enquire after the said Thomas Wackett, as Witness my hand Thomas Potts Sworn in Court the 15th. Day of March 1735/36". What ever all that was about I have no idea. But another entry that same year may refer to him or to a quite different Thomas Potts. It is intriguing but I have only the court entry: Middlesex sessions Sept 1736: "And the Said Thomas Potts hath also pleaded Guilty to an other Indictment against him for an Assault is fined for this Offence one Shilling to Estreated And he is Ordered to remain in Now Prison aforesaid untill the Sixth day of October next Then to be delivered paying his Fees 9s,,4d. By Adjorn on Wednesday the 22d. day of Sept". 2. This mahogany hood was made to house this miniature clock, maximum dimensions only twelve inches high by six inches wide. In February 1736(-1737?) he was a juror at a trial at the Old Bailey. In December 1750 he was again a juror at Westminster Sessions (regarding a case in the parish of St. James Westminster) and at the Old Bailey. In 1764 he was a juror at a Coroner's Court regarding a case in the parish of St. James Westminster. These all clearly relate to the same man. In 1749 he is listed in the Westminster Poll Book: Thomas Pott, watchmaker, resident between January and December of 1749 in St. James's Street, parish of St. James, Piccadilly. The fact that he was not a freeman of the Clockmakers' Company might suggest he worked for someone else, for as a journeyman he was not obliged to take up freedom. Such a freedom involved paying regular subscription and so many an apprentice out of his time delayed it, or avoided it altogether if he could. Benjamin Gray was born in 1676, and became a celebrated watchmaker, but not a member of the Clockmakers' Company. He lived on the west side of St. James's Street, some books tell me, from 1727 till 1752 when he is said to have moved to Pall Mall. He voted in the very same 1749 poll as Thomas Pott, being then in St. James's Street, the very same street. When his will was proved in 1764, he lived in the even more up-market Pall Mall; Thomas Pott outlived him by two years. Gray was appointed watchmaker to George II about 1744, and either later married the daughter of Francois Justin Vulliamy, or Vulliamy married his daughter, later trading as 'Gray and Vulliamy'. Which Vulliamy married which Gray depends on which books you refer to, as those I have consulted contradict each other - I can see another potential research project here, but not today. It seems likely it was Gray's daughter. Could it be that Thomas Pott worked for Gray, at least in his earlier years? If Gray was already trading in St. James's Street, is it feasible another clockmaker, the unknown Thomas Pott, could have set up there in opposition? And how could an orphaned apprentice have afforded to set up in such an up-market and fashionable address? But once he left Gray's service, perhaps when Gray moved to Pall Mall, and he had built up a reputation for himself ...? Why would it be seventeen years before Thomas Potts took his first apprentice? Did he work for the first seventeen years on his own? One explanation is that he could not take an apprentice if he was working as a journeyman for some other master. 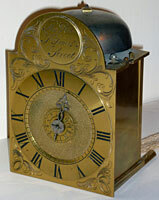 Very few clocks seem to have been noted over the years by Thomas Pott. I know of only two others (one longcase in Gloucester Museum and one bracket clock, pictured here) but there must surely be more. Yet he was working as a qualified clockmaker for forty-six years, a tremendously long time. Many a clockmaker working for a shorter period is known by a far greater output. This again might suggest he worked in his earlier years anyway as a journeyman. My feeling is that Pott worked for Gray. The clock itself is a darling of a clock, the dial measuring only three and a half inches wide and five inches high, the entire hood stands only twelve inches tall and six inches wide. I don't think I have ever seen one quite this small before. It is clearly built as a travelling alarm clock, self-sufficient without any case. The top plate has a built-in hanging hole, so that it could be hung from any hook in the wall of the bed chamber in whatever inn or tavern or friend's country mansion the owner might be staying - more satisfactorily than a hoop-and-spike type could, which can be prone to swinging round. The verge pendulum has a carrying hold-fast to hold it safe during travel. So do many verge clocks of course, but this one is ultra-neat because the hold-fast swivels upwards out of the way when the pendulum is in use and swivels down when needed for locking, a brilliantly simple idea but involving much more work of an intricate nature and beautifully done. I don't recall ever seeing that before. Travelling clocks sometimes had a rough wooden box for carrying them in. We have no way of knowing if this clock ever had such a box. It is housed in a mahogany hood. If it was used as a travelling clock, then it would need no hood. But this hood has been made either as an alternative or as its principle home. We have no way of knowing which, but the tiny hood appears to be contemporary with the clock. This was no common or garden hook-and-spike clock but a gentleman's travelling 'companion', such as only the best people might have desired. Most portable clocks have either open sides or tin dust covers that slide or pin into place, but not this one. This has two very substantial removable brass side plates fitted as dust excluders, but they slip beautifully into place and lock with decorative swivel latches at the top. I have never seen this done so neatly before. This was clearly a gentleman's treasured possession, quite fitting for the sort of clientele that would have strolled past the maker's door in St. James's Street.. I was quite pleased that my researches had gone reasonably well, till a fly dropped into the ointment. I found ANOTHER Thomas Pott, living at much the same period in the same parish as Thomas Pott the watchmaker. This Thomas Pott was an elderly miser in his dotage, when he wrote his own will in his own handwriting, with repetition and hesitation, rather than pay a clerk to do it. 3. 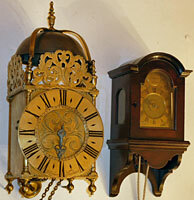 Here the clock is seen in its hood alongside a standard-sized lantern clock to demonstrate its tiny size. "March ye 2 1737 The last will and testament of Thomas Pott. Item I give to my wife Margaret pott item I give to my wife (repeated) all goods belonging to the house (we are - missed out?) living in and all debts that is owing. I make my wife Margaret pott my sole executrix ..... (Then a line later crossed out - I give to my nese (neice) Mary Pott two pounds ten shillings in lawful money) ..... Thomas Pott I publish and declare this is my last will and testament ritten with my own hand witness" - Jonathan Burton and two other illegible signatures. The will was so badly written that when it came to be proved in May 1745 two witnesses, including Jonathan Burton, "Gent. ", had to swear this was his hand writing and another witness had to swear that some eighteen months back he saw Thomas Pott 'of the parish of St. James, Westminster', cross out the line with the bequest to his niece. We do not know the trade of this Thomas Pott senior. It sounds as if he was long retired. He reminds me of miserly uncle Ebenezer in the House of Shaws of 'Kidnapped' fame, the one who led David Balfour by candle light up the stone staircase, where some of the treads were missing, hoping he would fall and dash his brains out so that he could keep his nephew's inheritance. He left his niece a bequest of two pounds ten shillings and then cancelled it? One wonders what dreadful deed poor Mary had done to make uncle Thomas change his mind and so leave her nothing - something very wicked no doubt! Moreover he kept this pathetically-written scribble another eight years without relenting and spending a few shillings to have it written up properly. It cannot be chance that another Thomas Pott (without an s) lived in the same parish as Thomas Pott, the watchmaker, who would have been just forty years old in 1737 when 'uncle Ebenezer' wrote his own will. He must surely have been related. Which brings me back to the possibility that back in Newcastle, Thomas's grandfather, another Thomas Pott, may have had another son, besides Thomas's father, Mark, and named him Thomas. Could this be the aged Geordie uncle of the clockmaker, perhaps living even in the same house. Did he hide him in the attic when Gentleman clients came to call? Though Gentleman Jonathan Burton knew him anyway. We will never know.